PC Power Management is critical for every IT organization as it helps minimize the environmental impacts and save money. The real goal is use computer on-demand , which means they should consume power only when some work is being done by the end-user and save energy when not it use. The scenario is just like our daily usage of room lights and fans - use them when you are in the room , turn them off while leaving the room.Now the question is how can we do this for computers ? Computer power management can be done using special software that can monitor the hardware and take them to lowest power demand state when idle or not in use.This is the fundamental concept for Green Computing. Lets consider how much power does a PC use ? So if your PC is using 100 W of energy , 43 W is being used by your monitor. Considering this an organization first needs to think about the monitors being used or to be purchased. If CRT monitors exist , get rid of them as early as possible because it uses approximately 70% (say 70W) of the total PC energy consumption as compared to LCD screens using only 15 - 40W energy. 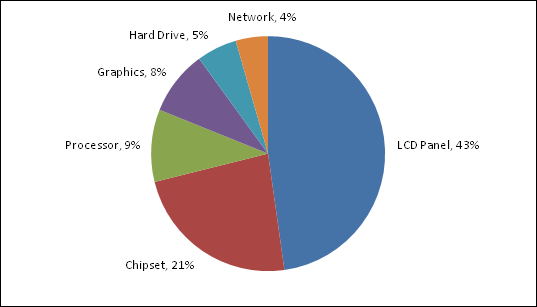 Next biggest energy eater is your chipset on the computer's motherboard - 20% of total power consumed. Well if you have already purchased computers,nothing can be done about this. Yes processor can sleep when not in use ... Regarding Graphics , Hard Drive and Network nothing much can be done to save power. Light Sensor embedded in a LCD Monitor : This sensors detects natural light around the screen and controls the brightness of the monitor in direct proportion, which means it dims the monitor in dark light and increases the screen brightness in extreme bright natural light. You can try this yourself , go in a dark room and try to read the contents of your screen with least screen brightness. Its easy to read it. Now try to read the same content under the sunlight or a CFL lamp , its tough to read with strain on your eyes.The reason this happens is , Human eyes love contrast (easy to differentiate between black and white but difficult to differentiate between two shades of white). Most mobiles in the market have this sensor just above the screen. Modern computers manufactured by vendors like Dell , HP, Apple also have it inbuilt into the LCD screen. The rule of classic engineering is , technology used to save energy should not consume more energy than the total energy saved.So using a sensor consuming 100W of energy to save 80W is meaningless. Practically sensors consume very less energy.So if the sensor is consuming 1W of energy for 10 hours trying to monitor the natural light around the computer , it uses say 10W of energy but it would save more energy by dimming the 40W screen when needed. Another way to save energy from LCD screens is by using operating system controlled power profiles. For example, OS will constantly monitor the computer usage and turn off the screen when idle for more than 10mins. If the organization has 10,000 computers , it would save approximately 10,000 * 50 = 50K watts of energy ... that's a huge saving ... and yes lot more can be done to save energy. Power profiles can be applied on computers to force them to a sleep mode when idle for more than 15 mins . Computers use only 3-5 W of energy in sleep mode.This sleep mechanism also known as "standby" doesn't hamper the productivity, so when you want the computer to wake up , it starts from where it had slept without loss of data and wakes-up in only 2-3 seconds (faster than humans). Useful when the end-user is out for a lunch (45mins) or a tea break(15-30mins). Sleep mode generally turns-off the monitor , puts the network device into a low power consumption mode (or Wake-on-LAN mode) , turns off the Hard Drive , processor powers down to its minimum state. This results in 90% energy saving.The main component that stays powered up is the RAM memory - this allows a fast restart from the sleep mode , because the OS and programs don't have to be reloaded from disk. Deep sleep is nothing but Hibernate state for a computer.This is similar to standby , but all the computer devices are powered-off and the current state of the OS along with the RAM contents are stored onto the hard drive.This state consumes 0W energy.On reboot , the computer starts from the previous state (takes more time to restore the state as compared to standby state), however during hibernate state the computer is disconnected from the network. A computer running 24 hours a day and consuming ~100 Watts per hour will need ~800 kWh a year , equivalent to $90 in US or $230 in Germany. Not all computer are in use 24 hours a day , so they should be turned off completely at nights and on weekends/holidays (office desktops).Don't worry if some configuration is to be done on weekends , Wake-On-LAN technology is being used. According to Gartner , the annual cost savings associated with a well-managed environment versus an unmanaged one is $43,300 for a size of 2500 computers. Conclusion : Save Energy - Go Green by "turning off devices when they are not needed", "buy energy efficient hardware" and "use power saving settings" to save money.